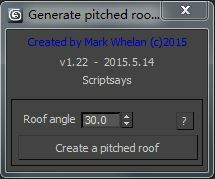 1.Generate pitched roof,Very easy to use modeling script. 2.The best system units to centimeters or millimeters, when the roof is generated using too large units more error-prone, and this self-test. 3. Spline to be closed, you can batch operation.